“Gregg Meyer … the chief clinical officer at Partners HealthCare, Meyer supervised the software upgrade. the emergence of scribes, including scribes in places like India where doctors transcribe recorded patient visits. 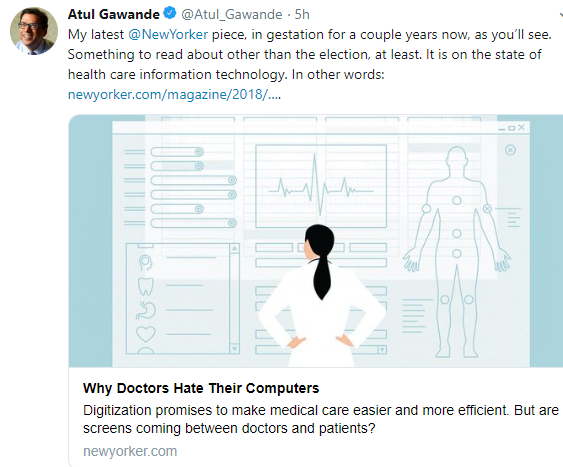 My take: This is a terrific article and shows why physicians are struggling with EMRs; this article explains the problem in a way that is easy for non-physicians to grasp. It shows that other professions face similar challenges. This entry was posted in General Health and tagged electronic medical record by gutsandgrowth. Bookmark the permalink. EMRs aren’t for physicians or for patients. They are billing platforms.